This very beautiful face mask comes from the inner coffin of a large ancient Egyptian sarcophagus, dated at around 1305-946 B.C. The red paint was painted over a layer of gesso and linen. Recently acquired by the Merrin Gallery, the broad oval face has a delicately carved mouth indented at the corners. The lips are outlined and almost form a smile. The nose is straight with recessed nostrils. The eyes are set wide apart and the cosmetic lines are emphasized in black, which of course was the custom of the day, but also makes this ancient work of art very powerful. The face is very sensitive and the artist who sculpted it, over 3,000 years ago, was clearly a master artist. Samuel Merrin presents another recently acquired, interesting ancient Egyptian piece. 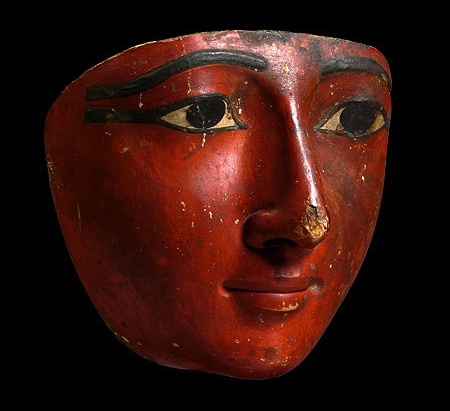 But for more information on this polychrome wooden mask, please visit the Merrin Gallery's website.